Den här balunen gör det möjligt att skicka 4 analoga ljud kanaler över en enkel Cat 5e UTP nätverkskabel. Tänk på att balunerna säljs styckvis. The Quad Audio Balun allows up to four (4) analog line audio signals to be transmitted via unshielded twisted pair (UTP) cable in a point-to-point connection. Used in pairs, the Quad Audio Balun eliminates up to four (4) coaxial cables, allowing audio-video equipment to be connected via space-efficient and cost-effective Category 5 twisted pair cable. 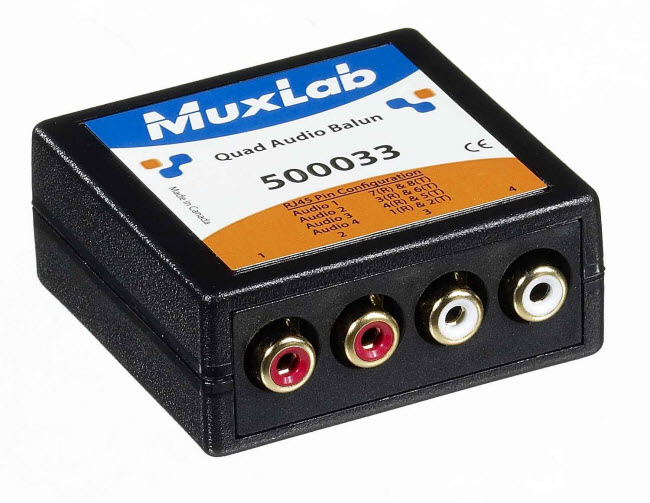 The Quad Audio Balun also works in conjunction with other MuxLab analog audio baluns such as the 500019.